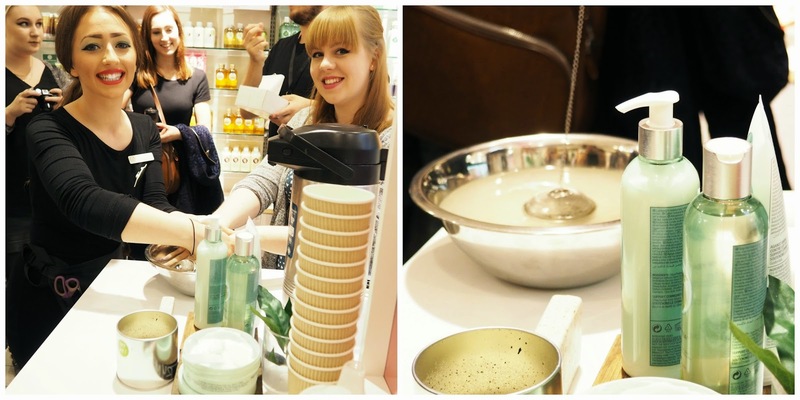 A few weeks ago I was very lucky to attend a bloggers evening in a local Body Shop Store! (White Rose Leeds) It has taken me quite a long time to upload this post… quite simply because I took SO MANY photos – and I knew that sifting through them was going to be a challenge! Why Kayleigh. The lovely White Rose Store Manager Leah tweeted about the opportunity for bloggers to go to a Body Shop Event and I was like AHHH! I love The Body Shop, and this was just an opportunity that I could NOT give up. Let me just tell you something…… The Body Shop has the most PERFECT photography lighting. Do you think they will mind if I take all my future post photographs in store? We were invited to view some brand new products and also view some products that are to be released in May / Summer, and trust me… you are in for A TREAT. Rhianna was the PERFECT hand model this evening! Her nails were BEAUT . 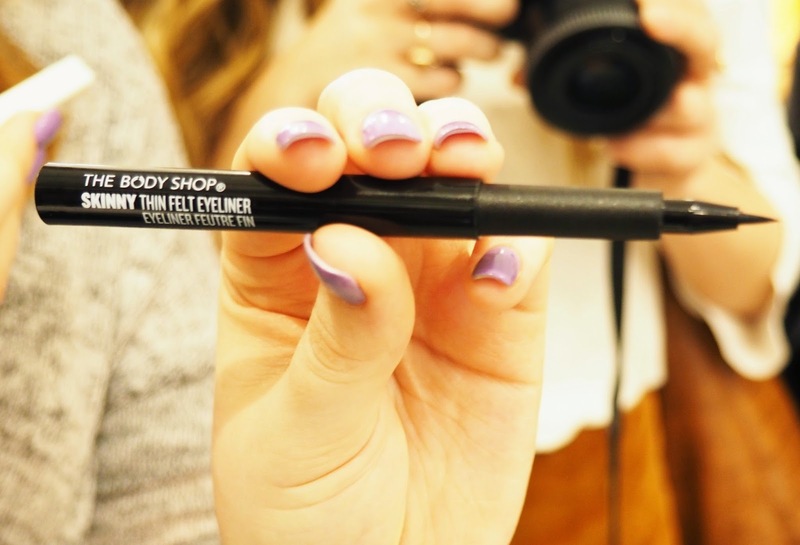 These two eyeliners are available in store NOW. The Skinny Thin Felt Eyeliner and The Bold Oversized Felt Eyeliner (Both £10) Felt tip pen liners seem to be the trend these days, but I have yet to find one that I get along with. Either that, or I seem to be getting duff products each time – they are always dried out when I get them / come out a grey formula rather than black! I am always on the hunt for new ones, so I might give these a go! 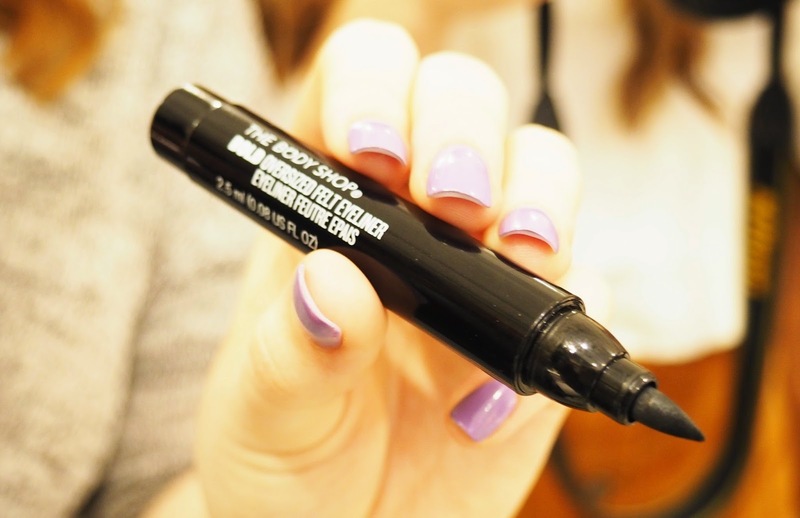 I personally would go for the finer tip, because I seem to always make it too thick anyway – even with a small tip! But these were super pigmented and drew on my hand with ease! NEW to the Vitamin C Range, for Dull, Tired, Grumpy Skin. (ME!!!) The Glow Boosting Moisturiser (£16.00) and Instant Glow Enhancer (£14.00) I am constantly looking for products that make my skin look healthy and glowing. 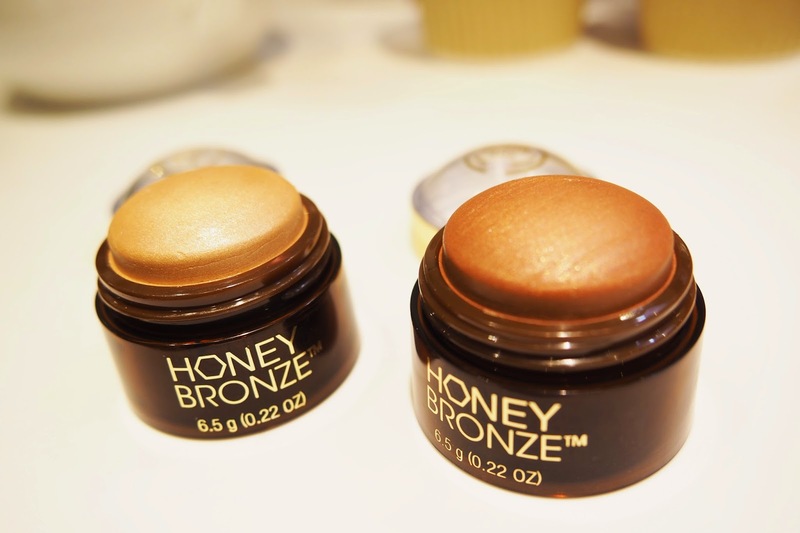 I really like the look of these products, the glow enhancer works kind of like a primer I believe. Both products revitalising for the skin and anti fatiguing. Recently I have been investing in products to make myself look less tired… and then I am like WHY DON’T I JUST SLEEP MORE! But there we go… I think I remember this smelling nice too! The Fuji Green Tea Range is a NEW range that is available now! “Revive the body, Detox the mind” Drinking Green Tea is known for it’s health properties, but it is also very good for the skin. It is quite a low toned fragrance, not overly powerful. I quite liked the scent, but not as much as other people did! I am into fruity scents, and this isn’t that. It is a very calming relaxing, kind of florally fragrance. I think it would be lovely after a day at work, it is a very fresh scent. Aww look at Rhi having a hand massage! Rhi’s hands were so soft afterwards! The statement product in the range for me, was the Bath Tea. For all you tea lovers, your dream is about to come true! Can you imagine having a bath in a cup of tea? Pop a little bit of the Bath Tea into the Tea Strainer, and swirl it around your bath for an extremely relaxing aroma, as well as lovely soft skin afterwards! It produces quite a creamy water colour (See above) One for the day where you fancy a bath, and would love to have really soft skin afterwards, without the bubbles. This product looks AMAZING. Unfortunately it was out of stock at the time of this event otherwise I would have walked away with it! The Drops of Youth Bouncy Sleeping Mask (£22.00) Yes, we do have to already think about anti-ageing 🙁 It contains Edelweiss Stem Cells, the idea is that it is meant to make the skin look ‘bouncier’ with it’s youth – enhancing formula. The product ACTUALLY bounces too – one of those products that you would constantly play with I think! I decided to purchase this lovely product. The Vitamin E Overnight Serum. (£13.00) I am really loving this! My skin looks so much healthier and replenished in the morning, it also smells divine. Thank you so much to The White Rose Body Shop Team, you were so lovely, as well as so helpful and I had a lovely evening! Excited for the next event! I also got to meet up with some fabulous bloggers including Rhianna, Gabby, Bridie and Leanne. 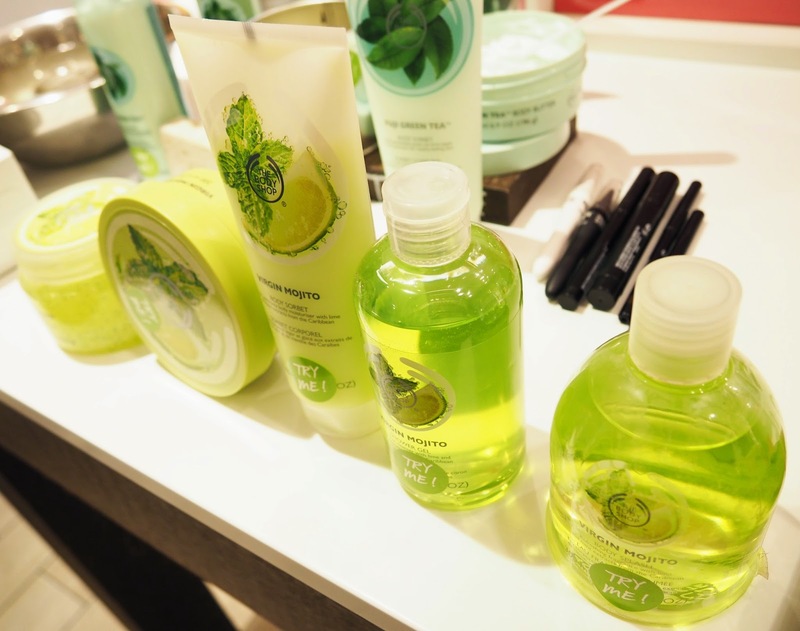 Thank you for reading lovelies, do any of these Body Shop products take your fancy? Good tips for future purchases me thinks! I love the body shop and I love the green tea idea! Heard good things about that bouncing sleep mask too! 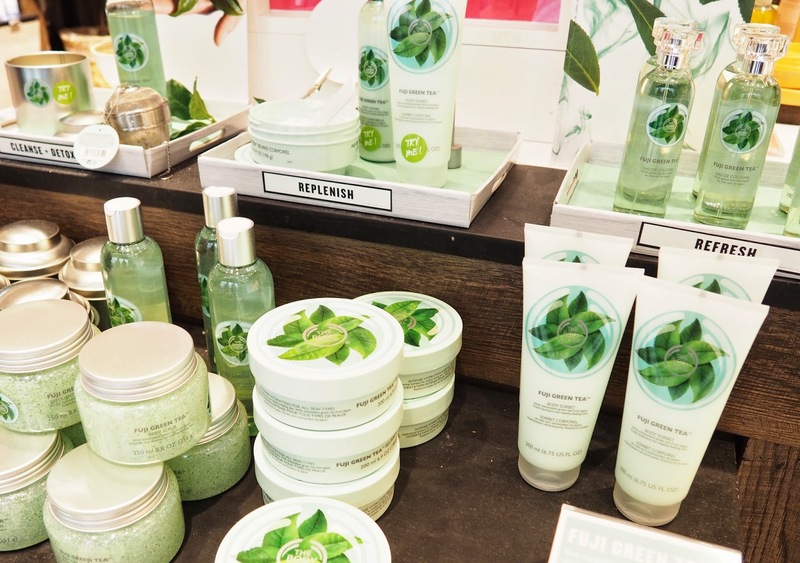 The mojito range sounds amazing! 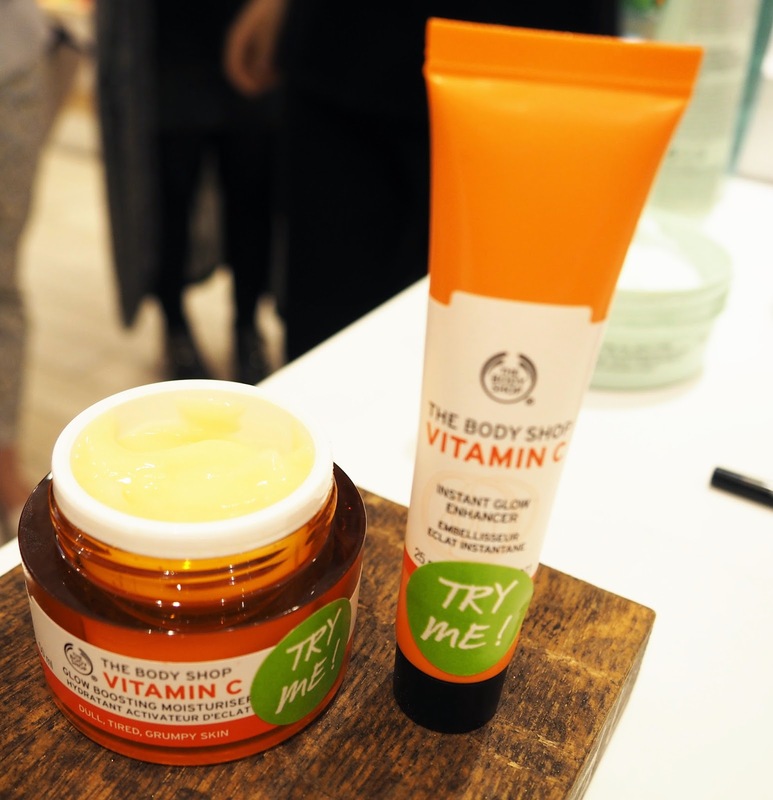 There's so many things I want to try from the body shop, I need a blogger event to happen!! These products look lovely! I'd like to try the mojito range! I need to look out for a Body Shop event in my area! I love the body shop, and this looks like such a fun event! I hope we get to go to one together sometime haha! Great collection of skin products and cosmetics! Must say this event is going to be a huge gathering of ladies. Glad to find it posted here! Got to know about so many useful and hygienic body products! Arranging such events are like challenges and I really appreciate that you people made it a successful one. Anyways, thanks for giving complete over view on these above products. Corporate Event Planning Boston. 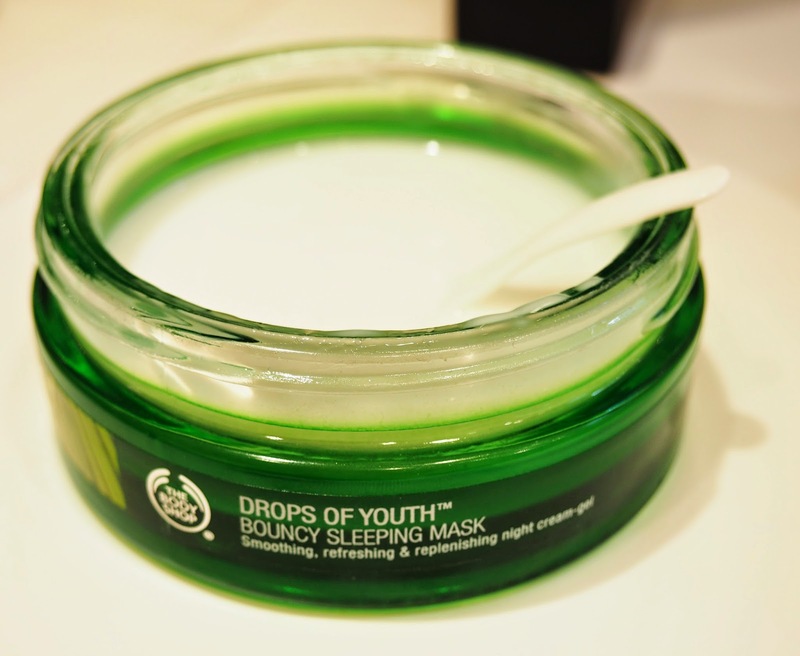 I am obsessed with the Drops of Youth Bouncy Sleep Mask (although I may be a tiny bit bias 'cause I work at The Body Shop). We're hosting another event this Sunday (10th July 2016) with hand massages, mini facials and summer make-overs. I'm quite new and didn't meet you last time you where in, but I read your blog as research before I went for the interview! It would be AMAZING to have you back to the store. Please come and join us. We're having another event next Sunday (10th July 2016) to pamper our customers before their holidays. I didn't meet you last time because I'm new, but I read your blog before I went for my interview! It would be AMAZING to have you back to the store, will you join us?